What windlass for a 22 ton cutter which will be anchoring a lot? I have exchanged contracts on a Nicholson 55. A fabulous sailing machine but I have to start from scratch in the anchor department, and since I expect to be making very heavy use of the anchor(s) I want to get it right. Money is not unlimited. The boat has twin bow rollers which are set up a bit above the deck. This photo of a sister ship shows the foredeck area (the inner forestay is off, but you can see the lever for it). The two deck eyes aft of the inner forestay and ahead of the hatch are just parking places for the staysail halyards and can be moved. There is loads of space in the chain locker. The boat is wired for 12 volts. The engine is a recent Yanmar and there are no hydraulics. I am expecting to dispose of the existing 1/2” G4 chain and replace it with 12mm. I have a completely open mind about vertical or horizontal but I do want something that will be durable (these boats are well known for being “wet” to windward) and easy to maintain, so I would prefer not too many mixed metals, and the ability to take it apart for attention. Re: What windlass for a 22 ton cutter which will be anchoring a lot? I will follow your thread here, as I am thinking about the same myself. Mine is still working, but it is from 1982, so I guess it won`t live forever. I have been looking on both Lofrans (titan) and Quick (hr5). My boat is a couple of tons more, but I am thinking about a 55kg (rocna or vulcan) anchor with 100m 12mm chain. The chain is about 3,4kg pr meter, so I am looking at 395kg with all chain out, worst case. And the windlass I have seen is then in the $5000 + range. And to be honest, that is a good slump of money. Thoughts on sizing a windlass. 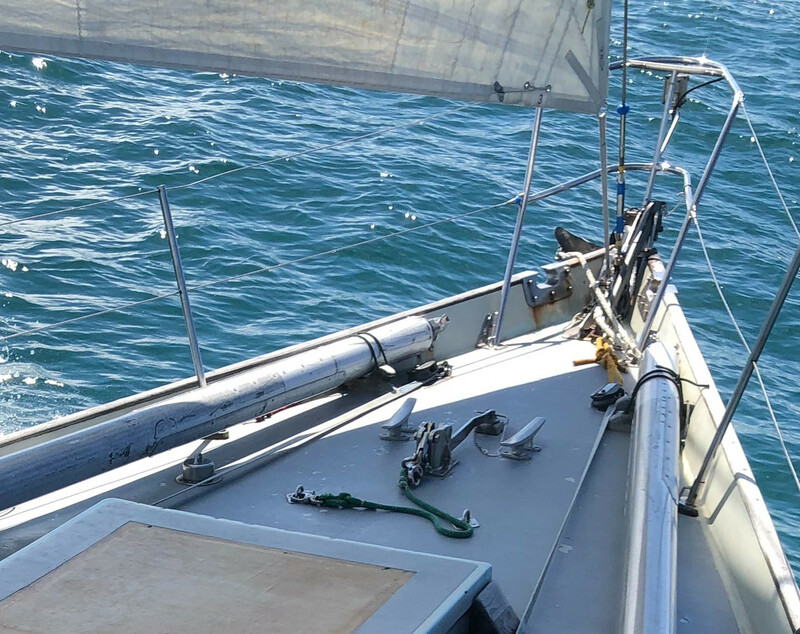 Calculate the total weight of the chain you are going to carry and the anchor then check the windlass is capable of lifting the total weight and maybe add a bit. Welcome to the forum and congratulations on the new boat. A 3500 lb windlass is about the largest that will run on 12v. With an anchor windlass big is better, although 3500 is not really large for this boat. Muir and Maxwell have the best reputation of the mainstream manufacturers, with Lighthouse as a extremely well build alternative (although their sizing is a little different and probably more honest). There are pros and cons regarding horizontal vs vertical, but for a retrofit it is more about which fits better. I agree that that gives a minimum, but in addition one can try the sort of approach that a Class Society takes in computing a merchant ship’s Equipment Numeral: calculate the wind load that the boat will put on the chain in F8 and compute the power needed to get the anchor up from a depth of one third of the length of the chain, with the engine on slow ahead? ( The number may be similar). That’s extremely helpful; a very experienced Australian friend also suggested Muir. We can give a thumbs up to the Lighthouse 1501. 300’ 3/8” chain and a 20kg Bruce. We installed it about 15 years ago and have been out cruising ever since. And no issues to report. First onto my short list is the Muir VCR 3500. With a working load of 397kg and a 1,500kw 12v motor, it just “makes the cut”, and it seems well put together with provision for maintenance. I considered and discarded the Lofrans Falkon, which is much cheaper, because I don’t like aluminium on a wet foredeck. The Lighthouse windlasses seem to be extremely well thought through, and beautifully made, but alas the boat seems to fall between the 1501 and the 3002, and with Sterling going down the tubes they are getting more and more expensive. In my dreams I would go for the 3000. Would strongly recommend you talk to Vetus Maxwell. Just changed Anchorlift windlass to Maxwell. Maxwell is very good to deal with. Mine is 20 tons 47ft chain 10mm Anchor 42 kgs - Lofrans Tigres, wire 50 mm² on 10m length. 12V. 1m of 10mm chain is 2,2 kgs, max is 85 kgs - Anchor 42kg = 43kgs left for the chain. 43/2,2 = 19,5m vertical lift. In fact, and tested it does not even more than 10 meters and gives up. DO NOT TRUST THE MANUALS. Best would be to go to a supplier that does the installation too and fix him to your parameters. Let him install and if it does not fit - make it to his problem! The boat has twin bow rollers which are set up a bit above the deck. . The anchor is the right place to start since you need anchor, chain, and windlass. I had to do the same process on my Oyster 55. I'm not meaning to start an anchor debate, but I chose a Spade. I talked to the Spade rep at the Annapolis Boat Show and he recommended a size for my boat. I bought one size bigger, a 99-pounder. It holds like a champ, but it is so large that I don't have room to mount a second anchor on the other bow roller. Well, I wouldn't want that much weight up there anyway. I sold the 75-pound CQR and put the 44-pound Bruce in the lazarette. Make sure the anchor you decide on is going to fit. Sometimes the roll bars on Rocnas and Mansons can be a problem on the roller. Next, the chain. I decided that a 3/8" chain was adequate and bought HT to keep the weight down. Finally, the windlass. I bought a Maxwell VWC3500 24 volt and have been very happy with it. The VW means vertical windlass and the C is for the chain pipe that feeds the chain directly into the chain locker. I have been very satisfied with it. You can buy them at several places online for around $3600. Not cheap, but it's a hoss! Consider adding a Maxwell Windlass Control & Chain Counter at the helm. It's another $500 plus installation, but it's the best "luxury" item I have on the boat. Well, maybe after the bow thruster. 44’, 20 ton, 125# Mantus, 3/8” chain, anchor almost exclusively. Lofrans Falcon. Curious, what is objection to aluminum on a wet deck? Welcome to the forum Methersgate. If you are interested, there are more details with annotated photos of the installation on this page of our blog. Best wishes finding what will best suit your needs.